"We are so proud of him." When the Frazier family adopted this adorable pup named Rebel from Oklahoma Westie Rescue earlier this summer, they knew right away he was a very good boy. But recently, the former stray dog revealed himself to be a hero, too. Rebel now lives at home in Tulsa with his family and their four other rescue dogs. It was there that, late last month, the furry gang was enjoying a romp in the backyard when near-tragedy struck. One of Rebel's new siblings, another Westie named Dax, took a tumble into the family's swimming pool and appeared to be unable to get out on his own. Fortunately, Rebel knew just what to do. As this dramatic security camera footage shows, quick-thinking Rebel then leapt into action — grabbing Dax by the collar and puling him out of the water all on his own. For that lifesaving act, Rebel is now being hailed a hero. And his former caretakers couldn't be happier. 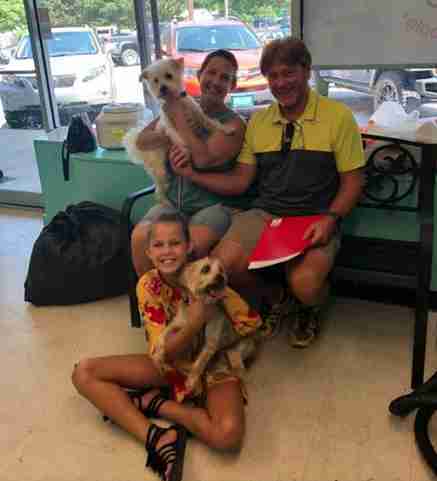 "We are so proud of him for saving his dog brother," Courtney Todd of Oklahoma Westie Rescue told The Dodo. "People often think that rescue dogs are broken, and are scarred for life. Rebel’s act of heroism proves that no matter their previous situation they deserve to have a second chance. Rebel is also a great example that rescue pets are amazing, and such loving creatures full of wonderful surprises."